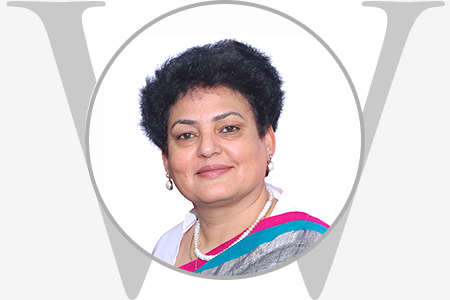 Rekha Sharma assumed the charge of Chairperson, National Commission for Women on August 7, 2018. She has been a member of the Commission since August, 2015. Before joining the Commission, Smt. Sharma was actively associated with civil society organizations in different capacities. Rekha has worked extensively on issues impacting women’s lives. She has conducted over 50 inquiries in matters relating to deprivation of women’s rights and liberty. Smt. Sharma has been championing the cause of vulnerable sections of women, including women workers in tea gardens that have been closed, and women in shelter homes. The issues related to female prisoners are particularly close to her heart. She has actively been advocating for improving the conditions of the women prisoners, especially the undertrails. She has been visiting a number of jails and made recommendations for improving the facilities provided to the jail inmates. Prior to joining the Commission, she was a Member of the District Consumer & Redressal Forum in the Government of Haryana. Rekha has also been instrumental in the establishment of a registered NGO called ‘Haryana Mahila Uthan Samiti’ which works for the empowerment of rural women in the state.